Acme Corrugated Is Proud to Announce FSC® Certification! - Acme Corrugated Box Co., Inc. The Forest Stewardship Council® is an independent, non-profit organization that “protects forests for future generations.” This is accomplished through setting standards for responsible forest management. Nearly all of the paper used by Acme Corrugated is purchased from paper suppliers who are FSC certified. Early in 2016, Acme Corrugated became an FSC certified supplier. What does FSC Certification mean for Acme Corrugated? 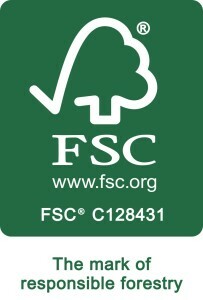 Acme can now offer clients FSC certified products that carry an FSC Claim with them. Qualified finished products can carry the FSC Label with Acme’s unique certificate number. Papers purchased by Acme are received bearing either an FSC Mix or FSC Recycled. Based on the combinations of papers used in production of corrugated board, Acme’s finished product will qualify as either FSC Mix or FSC Recycled. The specific papers used determine the exact classification, with most Acme products meeting the requirements for FSC Mix. What is required for labeling products bearing the FSC Claim? Only FSC Label generator or other means approved by the certification body can be used. Label will state the appropriate FSC Claim. Label placement (artwork) must be approved prior to use in production. Label can appear as an element within the overall graphics of a box (such as with a full-mount plate) or as another element comparable to cert stamp and box ident. Label must be clearly visible on the product. Additional rules apply and will be considered during artwork approval process. What is the value of FSC Certification to Acme clients and prospects? FSC certification provides a natural complement to Acme’s existing sustainability policies. FSC certification demonstrates Acme’s commitment to responsible use of resources. Clients promoting their own responsible environmental practices can now use the FSC Label on eligible products to provide a visible, recognizable image.